Last month my neighbor hosted a few of us for a games and snacks night around Christmastime. While we were visiting another neighbor mentioned a book called Zippy Chippy. This book is about a racehorse that ran 100 races and never once won earning a title of “most lovable loser.” She stopped by the next day to have me borrow the book. She told me that he lives his retirement at a facility called Old Friends, which is located minutes from my grandma’s home. I don’t usually have many opportunities to sit down and read so I am slowly working through the book myself. I did,however, purchase the book for my grandma and this past Saturday my aunt, Zac, and I all took grandma to Old Friends at Cabin Creek. Grandma has been telling me about the place for months. The original Old Friends was opened in Kentucky by Michael Blowen when he learned that a Kentucky Derby winner, Ferdinand, was sent to slaughter in Japan. Years later Old Friends at Cabin Creek was opened in 2009 and it is located in Upstate NY, less than 30 minutes from Saratoga Racecourse….and only minutes from my grandma. Tours are available year-round on Saturdays from 12-3 and daily during track season. Currently Old Friends at Cabin Creek is home to 15 thoroughbreds who collectively have run 628 races and won $8,868,865 over their lifetimes. Three of these fifteen horses include stallions. The rest are geldings. I was surprised that there were no mares. Three stallions live on the hill overlooking the rest of the property so I imagine it makes sense to not have mares that may cause a stir among all the “men,” especially with the farm being open to public. 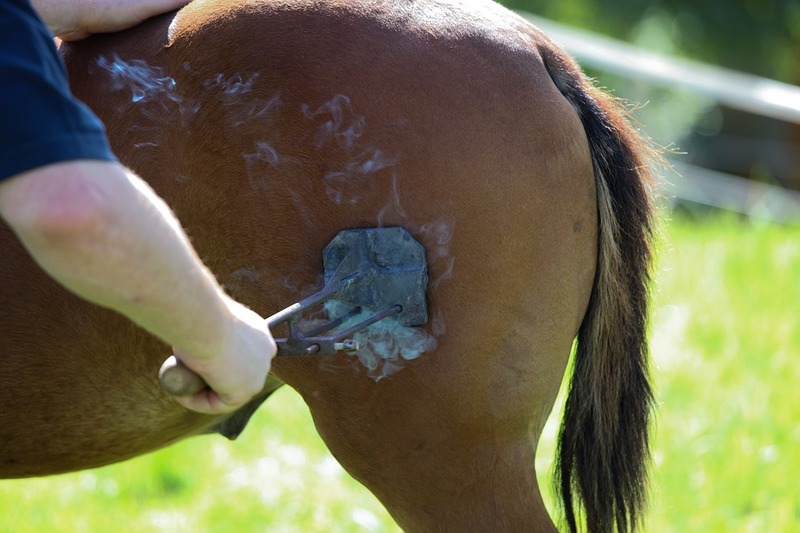 On that note I’d love to see a retirement facility aimed at mares who get little attention and are often sent to be neglected broodmares used simply to pump out the next generation…but I digress…. Saturday was a cold but beautiful day. The sun was shining and the wind had given us a break. The four of us went to Old Friends for a lovely tour to see the many beautiful retired thoroughbreds they home. The first horse we met was Roaring Lion “Leo” a handsome fifteen year old gelding who has won $542,536 from 32 starts. Strummer is a sixteen year old gelding who won $409,051 from a total 56 starts. Walking down the lane (I’ve since began calling it “gelding lane”) our next stop was Watchem Smokey and Cool and Collective. Watchem Smokey is 19 years old. After recovering from a first injury he continued to race until he tore ligaments in his leg. Out of 50 starts he won $513,897. Cool and Collective is one of several NY bred geldings at Old Friends. He had an unusually long career, racing until he was 13 years old in 81 races winning a total of $678,836. A lifelong habit of cribbing has permanently damaged his teeth so he often sticks his tongue out. It’s quite a cute mug he has! Next we met Doc n Roll, a 14 year old gelding, also NY bred. Doc sold for $125,000 in auction. During his $156,585 career of 16 starts he won the New York Stallion Cab Calloway Stakes. After the track he was retrained for jumpers but he came to Old Friends when his heart clearly wasn’t in it. Across the lane we met Commentator; “Tator” is a feisty 18 year old redhead. He broke his maiden (won his first race) right in Saratoga. He was a well known and well loved horse winning the Whitney Handicap in Saratoga twice and the last running of the Massachusetts Handicap in 2008. During his career he only ran 24 races but he won $2,029,845. His sucess earned him the 2007 & 2008 Horse of the Year in New York and he was given a peppermint key to the city of Saratoga Springs. Belmont holds an annual race in May in his honor; the Commentator Handicap is a 1 mile race open to NY breds. This Hard Land “Frankie,” an 11 year old with some excellent bloodlines. This horse was super sweet and raced exclusively in New York. Of 48 starts he earned $451,221. He shares a paddock with Commentator. What’s cool about this is of the races he’s won, the Commentator Handicap happens to be one of them! At the end of the lane we came to Be Bullish a 14 year old grey NY Bred gelding who won first race. His success includes him being the 30th NY-bred to win over $1,000,000 and only one of 5 horses to win Hollie Hughes States at Aqueduct multiple years. Be Bullish ran 87 races and brought home $1,106,288 in earnings. The best thing I believe about this horse is the duty one of his owners had. After previously selling Be Bullish Mike Repole decided to buy him back in order to secure a good retirement for his horse. Most owners are not horse people and treat their horses as mere commodities, sometimes never even meeting the horses. Mr. Repole is among the good and responsible horse owners. Down at the far corner of the property lives the inspiration for my visit. I had been meaning to visit for a long time but this horse motivated me to actually do it. ZIPPY CHIPPY. The oldest horse at the retirement facility at 28 years. As I mentioned before, Zippy ran a whopping 100 races, never won, and brought home $30,834. His owner Felix Monserrate liked Zippy’s personality. Zippy was full of piss and vinegar getting him banned from every track in America but the Northampton Fair in Massachusetts; he’d stop mid-race, refuse to leave the gate, and bite. Despite all this Felix loved him. He was never entered in claims races (where someone can claim “buy” a horse post-race) and often ran races that were too difficult. Red Down South is Zippy Chippy’s paddock mate and takes care of his aging friend. The photo on Old Friends’ main page depicts the meeting of the two geldings who instantly became buddies. Red is 19 years old, another NY-bred, and brought home $116,330 out of 32 starts. He is also Zeno Bay’s cousin as they share a paternal grand-sire Dixieland Band. Walking back toward the barn King Congie woke from his afternoon nap to see us. This 11 year old gelding ran the 2011 Preakness. He raced 11 times winning $243,740 and retired after sustaining a broken leg at an Aqueduct allowance race. He was passed on to a new owner and eventually found himself in an auction, likely to be slaughter-bound. Rosemary Farm found and rescued him and contacted the breeder West Point thoroughbreds. West Point was upset by Congie’s fate and did the right thing to secure his retirement; another piece of evidence that decent owners do exist in the racing industry. It was a happy ending for all and now King Congie happily naps in the afternoon sun. We returned back near the barn after seeing all the geldings on what I will call “gelding lane” but there were still a few horses yet to see. Grandma was having a blast and despite a bad foot and cold weather she wanted to continue on. Up on the hill lives the stallions of Old Friends (plus one gelding). Will’s Way is a moody stallion and the second oldest on the farm at 26 years. His biggest win came in only his 6th race at the 1996 Travers, Saratoga’s most famous and sought after race. In all he ran only 13 race but came in the money for 11 of them and brought home $954, 400. He had a successful career as a stud, siring 171 foals. Wills Way’s dam (mother), Willamae, is Zeno Bay’s paternal grand-dam. Mr. Cowboy lives closet to the owner’s home. He was born right here at this farm only months before it became Old Friends. Mr. Cowboy was initially stillborn but was saved after given mouth to mouth CPR. Not walking for 3 days he grew up to be strong and healthy. 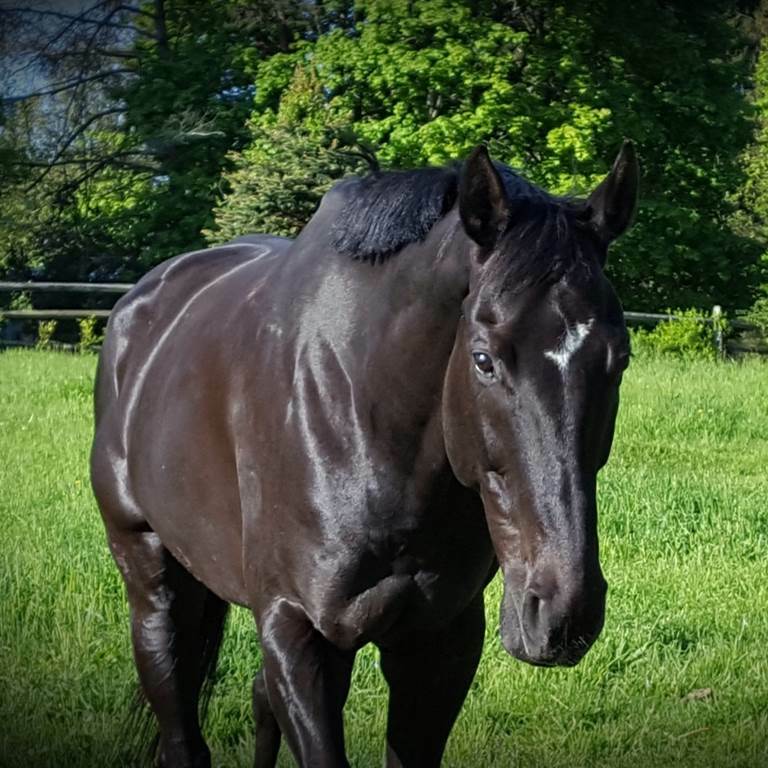 He’s now 10 years old and retired after winning $80,930 in 13 starts. Cosmonaut is another grey at Old Friends. During his career he was a silver/grey and over time he’s lightened up quite a bit (this isn’t uncommon but not everyone knows it and still cool in my books). He is a stallion of 17 years and broke his maiden at Saratoga. In 36 races he took home $1,397,723. As a stud he sired 39 winners with total progeny earnings of over $3 million. The last horse on our tour was Slew’s Brew an 8 year old stallion. The famous Seattle Slew is the paternal great grandsire on both his sire’s and dam’s side. Slew’s Brew was raced exclusively in New York and broke his maiden at Saratoga. He is a newcomer as he retired only last year after running 29 races and earning $186,649. Zeno Bay’s Sire is Slew’s Brew’s great grand-sire. The horses are all exquisitely cared for. They are all friendly and come up to the fence though most are all too used to the lifestyle they lead. Visitors mean treats and most of them get very pushy and mouthy. The paddocks and sheds are meticulously maintained. All the horses were naked with exceptional winter coats. Although many are considered seniors and “aged” they all had excellent body condition and some were even a bit overweight. This is proof that thoroughbreds AND senior horses CAN look great if you feed and care for them right! JoAnn clearly knows how to keep these boys healthy even in their later years. You can learn more about the horses, the farm, and its former residents (that have passed on or gone to new homes) by visiting http://oldfriendsatcabincreek.com/. You can also support the horses and facility through the “Donate” link on their page. On this page you can see the wish list, you can buy hay or grain for the boys, you can make a one-time donation, or even set up a recurring donation. If you live in upstate New York you can also volunteer your time. The horses that live at Old Friends are quite accomplished and they had responsible owners who wanted to do what’s right for the animals. The horses were bred with purpose, trained, and many careers were made on these horses’ backs. Every year North America brings about 20,000 new thoroughbreds into the world. Not all are as successful as these horses and not all have owners that consider aftercare their responsibility. Of the three at my home, only one had a responsible owner. Blade’s former owner ensured his aftercare until he found me and even then asked for a “no sale” contract within our adoption agreement. Blade was a money-pit from the start and never made money on 6 races yet still he was kept safe from the kill-pen. The other two amigos weren’t as lucky and almost did go to Canada for meat. Zeno Bay made $15,747 in only 7 races until what I’m guessing is a sustained injury (he has a lot of arthritis and a bowed tendon). Vai Via ran 47 races and won $40,165. Caring for horses is a major undertaking requiring vast amounts of time and money. We need more farms like Old Friends that provide these athletes with a soft place to land. Furthermore we need more responsible people, breeders and owners especially, who support the aftercare of their horses so they don’t find themselves in neglectful situations or on a meat-truck. I really enjoyed our visit to Old Friends but even more-so I loved having the chance to share this with my grandma. She had such a great time. Thanks for this great tour of the Farm. It’s good to know there are people who care for retired horses. There is an organization here in Minnesota that re-homes retired or unwanted thoroughbreds. I met a woman who had one that she rode. Quite a handful he was at first, but he was a beauty and became a good horse to her. So true, but they are so special.